One year after Vincent van Gogh’s suicide, Postman Joseph Roulin (Chris O’Dowd) asks his son Armand (Douglas Booth) to deliver Van Gogh’s last letter to his brother, Theo. Roulin finds the death suspicious, as merely weeks earlier Van Gogh claimed through letters that his mood was calm and normal. Armand reluctantly agrees and heads for Paris where he finds out Theo Van Gogh is dead as well. So he starts an unofficial investigation leading him further on to Auvers-sur-Oise and look for Dr. Gachet (Jerome Flynn) who housed Van Gogh during the last months of his life, after his release from an asylum. What were the real circumstances of Van Gogh’s death? Is it possible to find the truth after a year? own. The filmmakers chose classically trained painters, in total 125 artists from over twenty countries, to create this incredibly ambitious and original story. In times where everything has to be ‘instant’, ‘fast’ and ‘immediate’ the production lasted four years. It began with a live-action cast filming against a green screen. After filming, editors composited Van Gogh paintings into scene backgrounds, and finally cut the movie together. Still it wasn’t over. Once the actual film was complete, they shot each individual frame onto a blank canvas, and artists painted over each image, a truly benedictine work. Still the effect is really jaw-dropping – just look at the trailer. By the way, if this movie isn’t awarded an Oscar, it will be for purely political reasons, nothing else. It deserves every movie award available or so is my highly skewed and personal opinion. If I had to complain a little bit, and it would be really a rather minor problem, I’d say the actor playing Vincent Van Gogh (Robert Gulaczyk) didn’t look like that painter at all. On the other hand the rest of the cast, especially Douglas Booth playing young Armand Roulin, was spot-on. 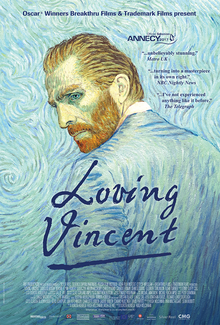 A highly recommendable movie not only for those who like history of modern art and impressionists. Do watch it if you get a chance. This entry was posted in animation, biographical drama, movie review and tagged animation, art, dorota kobiela, history of art, hugh welchman, impressionists, loving vincent, movie review, one brilliant movie. Bookmark the permalink. Polecam ten film bez najmniejszych wątpliwości i dziękuję za wizytę! I totally forgot about this movie! Thank you for reminding me. D: I want to watch this now!!!!!!!!!! Mission accomplished!!!! Yes, yes, yes, do watch it!